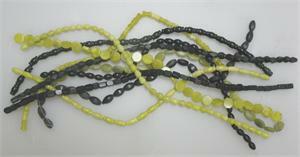 Item #MX-SE-12-20: Lot of ten 16" long temporary strands of assorted Green Serpentine & Black Stone Beads. Item #AGB-10-49: Lot of ten 16" long temporary strands of assorted shapes & sizes of Gemstone Stone Beads. Item #BD-12-35: Lot of twelve 16" long temporary strands of assorted Gemstone Beads. Varied shapes, sizes and colors. You will receive a mixed assortment of our choice.